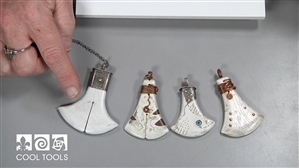 In this video, Robert introduces us to Faux Bone, a product he founded himself. Robert demonstrates how to cut, shape, color, engrave and embellish this non-toxic material. The ability of Faux Bone to take on a variety of finishes, as well as its incredible strength, light weight, extraordinary impact resistance and low cost make it a natural for artists and craftspeople in all disciplines. Faux Bone can have the flexibility of wire, the functionality of metal and showcase beautiful color like beads…the best of all worlds in one material. When heated, it can be tangled and twisted, knotted and even crocheted. When solid, it has the properties of metal in that it is nearly unbreakable and can be drilled into, sawed, and easily connected with nuts and bolts and rivets and screws.